Maruti Kizashi is the upcoming car from the the small car heroes Maruti. Maruti Kizashi is expected to be launched soon. The prince range of this machine will be around 16.5 lakhs (for MT) and 17.5 Lakhs for AT model. They will be delivered to customers by the start of March. A Maruti Kizashi can be booked by paying a minimal amount of Rs 50,000 only. 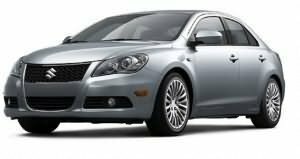 Maruti Kizashi is a sports sedan of mid-size and the production model was first shown at Auto Expo 2010 Delhi. The car has an alluring look it is designed in U shape with upper and lower grille, foglights etc. The car looks very elegant form both front and rear angles and comes equipped with all luxuries features. Overall the vehicle is a complete package of qulity features and powerful engine with stunning exteriors and interiors. The interiors are very spacious and roomy with leg room space with other storage area. The company guarantees its fuel efficiency to be around The fuel 12.53 kmpl (AT) and 12.45 kmpl (MT). Here are the complete features, review, specification and price details of Maruti Kizashi. * 4 cylinder, 16 valves DOHC. 4 cylinder, 16 valves DOHC.